Crème brûlée has a rep for being notoriously temperamental. Do it right and you have a soft, creamy custard filling with a caramelised top so crispy, it satisfyingly shatters under the tap of your spoon. Do it wrong and you’re left with a scrambled mess that’s going straight in the bin. This easy recipe only uses four ingredients. 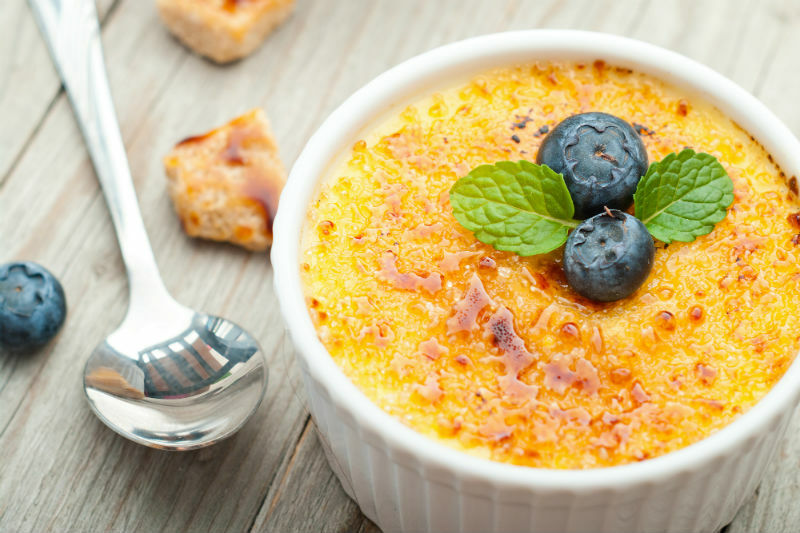 You can make your crème brûlée as simple or as experimental as you like. But the main thing to remember is to take your time. Preheat the oven to fan 160°C/gas mark 4. In a large mixing bowl, beat the sugar and egg yolks together for about a minute. You want the mixture to turn pale and fluffy. Set aside while you concentrate on the vanilla and cream. Slice the vanilla pod lengthways and scrape out the seeds. Set the seeds aside and chop the rest of the pod into small pieces. Pour all of the cream into a medium sized saucepan and add the chopped vanilla pod and seeds. Gently bring the cream to boiling point. Take the saucepan off the heat once you see small bubbles appear around the outside of the pan. Now you want to remove the vanilla pod and seeds from the cream. Place a sieve over a bowl and strain the mixture until it’s smooth. Pour the hot, smooth cream into the sugar and egg mixture and stir with a wire whisk. Keep whisking until the mixture has thickened. Pour the mixture into six small ramekins until two thirds full. Place the ramekins in a deep roasting dish and pour hot water into the roasting dish to create a bain-marie. You want to fill it with water until it comes halfway up the ramekins. Place the roasting dish onto the middle shelf of the oven and bake for 40-45 minutes. Keep an eye on the brulees, you want the custard to set but still be a bit wobbly. Take the ramekins out of the roasting dish and leave to cool to room temperature. Sprinkle a little Demerara sugar over the top of each brûlée and caramelise with a kitchen blowtorch. Learn how to use a kitchen blowtorch with our simple three-step guide. Feeling inspired by this recipe? Check out our recipes page and let us know how you got on by posting a picture on our Home Chef Facebook page.